Quantum computation is among the most far-reaching and challenging of quantum technologies. Based on quantum bits that can be zero and one at the same time and instantaneous correlations across the device, a quantum computer acts as a massive parallel device with an exponentially large number of computations taking place at the same time. There already exist many algorithms that take advantage of this power and that will allow us to address problems that even the most powerful classical supercomputers would never solve. Image8-Qubit superconducting quantum processor fabricated at ETH Zurich. 10-15 quantum bits have already run basic algorithms and protocols. Many platforms and architectures have demonstrated the basic principles of quantum computing based on solid-state systems (electron spins in semiconductors, nuclear spins in solids, Majorana zero modes) and on atomic and optical systems (nuclear spins in molecules, hyperfine and Rydberg states in atoms and photons, to name but a few). Due to technological interest and the evident limitations of existing approaches, referred to as the “end of Moore’s Law” of computational scaling, global IT companies have been taking an increased interest in quantum computing in the last decade. Advances in quantum computer design, fault-tolerant algorithms and new fabrication technologies are now transforming this “holy-grail” technology into a realistic programme poised to surpass classical computation by ten to twenty years in some applications. With these new developments, the question companies are asking is not whether there will be a quantum computer, but who will build and profit from it. Intel, HRL Laboratories and NTT, for example, are supporting spin qubits in semiconductors; Google, IBM and Intel are investing in superconducting qubits; D-Wave is producing a superconducting quantum annealer; Microsoft is betting on topological quantum bits; and Lockheed Martin and INFINEON are supporting research with trapped ions and their interface with photons. With world-leading research in quantum computing located in Europe, many IT companies have chosen academic partners in Europe for their R&D efforts.Realising quantum computing capability in Europe on a decade-long timescale will require synergy between industrial and academic partners, as well as involvement of engineers from institutes like Fraunhofer, IMEC, VTT and LETI in multidisciplinary consortia. The hardware efforts have to be complemented by the development of quantum software to obtain optimised quantum algorithms able to solve application problems of interest. Europe is a leader in the development of software for classical high-performance computing applications and so is well placed to establish the emerging field of quantum software engineering, with a number of leading quantum software groups already active and interacting with hardware teams. In 10 years, quantum algorithms demonstrating quantum speed-up and outperforming classical computers will be operated. The design of aircraft, buildings, cars and many other complex objects makes use of supercomputers. By contrast, we cannot yet predict if a material composed of few hundred atoms will conduct electricity or behave as a magnet, or if a chemical reaction will take place. Quantum simulators based on the laws of quantum physics will allow us to overcome the shortcomings of supercomputers and to simulate materials or chemical compounds, as well as to solve equations in other areas, like high-energy physics. ImageMeasured atom distribution of an ultracold quantum gas held in a two-dimensional crystal of light for the two distinct quantum phases of a Bose-Einstein condensate (BEC) (left) and Mott insulators with increasing particle numbers (middle & right). (From Immanuel Bloch's group at MPQ Munich). Quantum simulators can be viewed as analogue versions of quantum computers, specially dedicated to reproducing the behaviour of materials at very low temperatures, where quantum phenomena arise and give rise to extraordinary properties. Their main advantage over all-purpose quantum computers is that quantum simulators do not require complete control of each individual component, and thus are simpler to build. Several platforms for quantum simulators are under development, including ultracold atoms in optical lattices, trapped ions, arrays of superconducting qubits or of quantum dots and photons. In fact, the first prototypes have already been able to perform simulations beyond what is possible with current supercomputers, although only for some particular problems. This field of research is progressing very fast. Quantum simulators will aim to resolve some of the outstanding puzzles in material science and allow us to perform calculations that would otherwise be impossible. One such puzzle is the origin of high-Tc superconductivity, a phenomenon discovered about thirty years ago, but still a mystery in terms of its origin. The resolution of this mystery will open up the possibility of creating materials able to conduct electricity without losses at high temperatures, with applications in energy storage and distribution and in transportation. In 10 years, prototype quantum simulators solving problems beyond supercomputer capability, including in quantum chemistry, the design of new materials, and optimisation problems such as in the context of artificial intelligence. Communication security is of strategic importance to consumers, enterprises and governments alike. At present, it is provided by encryption via classical algorithms, which could be broken by a quantum computer. This motivates the development of quantum-safe cryptography, that is, encryption methods that quantum computers could not break. Secure solutions based on quantum encryption are also immune to attacks by quantum computers, and are commercially available today, as is quantum random number generation – a key primitive in most cryptographic protocols. devices, possibly involving satellites, are needed to reach global distances. The advantage of quantum repeaters lies in extending the distances between trusted nodes. The building blocks for fully quantum repeater schemes are twofold: a small quantum processor and a quantum interface to convert the information into photons similar to the optoelectronics devices used in today’s internet, but with quantum functionality. These building blocks have already been demonstrated in the lab, but years of R&D are still needed for them to reach the market. As soon as this happens, true internet-wide quantum-safe security, sensor networks, or distributed quantum computing, could become a reality. In 10 years, development of autonomous metro-area, long distance (> 1000km) and entanglement-based networks, a “quantum Internet”, as well as protocols exploiting the novel properties that quantum communication offers. Superposition states are naturally very sensitive to the environment, and can therefore be used to make very accurate sensors. 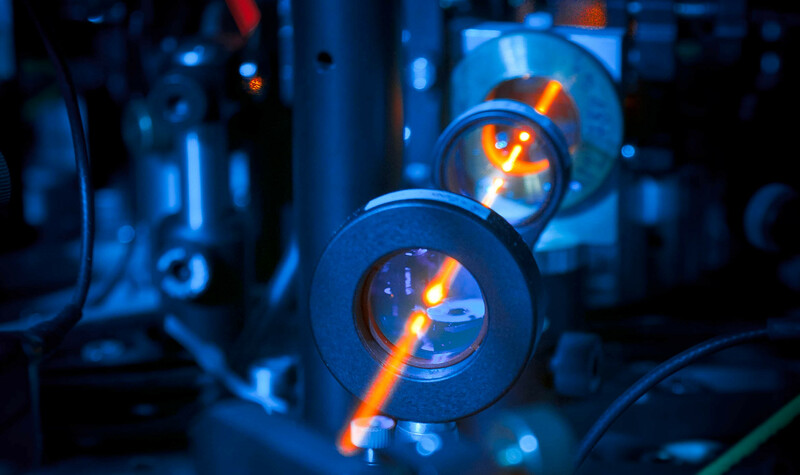 As a result of steady progress in material quality and control, cost reduction and the miniaturisation of components such as lasers, these devices are now ready to be carried over into numerous commercial applications.Solid-state quantum sensors, such as NV centres in diamond, have been shown to be useful for measuring very small magnetic fields. 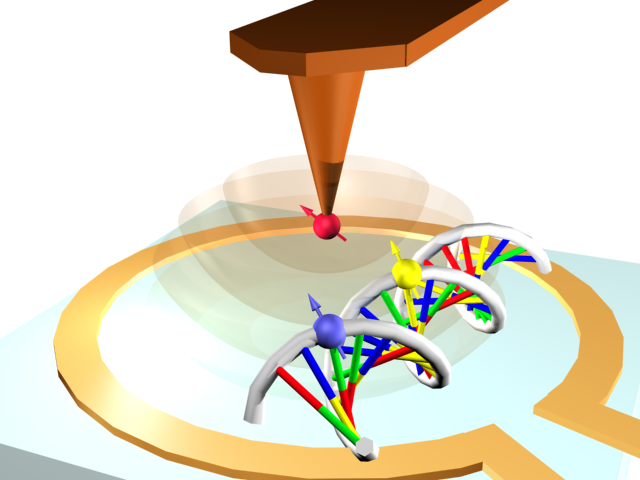 ImageArtistic depiction of a spin based quantum sensor for unravelling structure of single biomolecules. This in turn may help with multiple applications, ranging from biosensors to magnetic resonance imaging and the detection of defects in metals. Superconducting quantum interference devices are one example of an early quantum technology now in widespread use, in fields as diverse as brain imaging and particle detection. Quantum imaging devices use entangled light to extract more information from light during imaging. This can greatly improve imaging technologies by, for example, allowing higher resolution images through the use of squeezed light or creating the ability to produce an image by measuring one single photon which is entangled with a second, differently colored and entangled photon that is being used to probe a sample.Atomic and molecular interferometer devices use superposition to measure acceleration and rotation very precisely. These acceleration and rotation signals can be processed to enable inertial navigation devices to navigate below ground or within buildings. Such devices can also be used to measure very small changes in gravitational fields, magnetic fields, time or fundamental physical constants. In 10 years, transition from prototypes to commercially available devices.